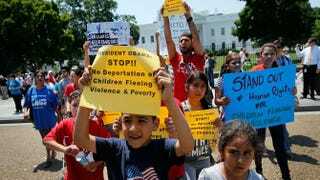 Young children join immigration-reform protesters while marching in front of the White House July 7, 2014, in Washington, D.C. Since President Obama has decided not to move forward with any immigration-reform work until the midterm elections are over, voter-advocacy groups are finding it hard to get disappointed Latinos to the voting booths this fall. But the deportation issue is very important to many Latino constituents, and some of them may no longer have an incentive to vote in the midterm elections in November—a cycle that already garners less of a voter turnout than the presidential elections. “So activists are facing a tough question: What do they do? How do they inspire Latinos who never show up in big numbers in midterm contests anyway to cast their ballots? And for whom should Latinos vote? For the Democrats who did little to advance immigration reform or for Republicans who outright opposed it?” Al-Jazeera ponders. Back in July, Republicans raised a brouhaha over President Obama’s request to spend $3.7 billion on an assortment of initiatives that would address the tens of thousands of undocumented child immigrants who walked across the border into the U.S., which included sending money and resources to the Central American countries from which the child immigrants originated so that the countries would be better-equipped to take them back. But even though Democrats have put forth some effort, and the Republicans not so much, Latino advocacy groups still place blame on both parties for the way in which immigration reform has been sidelined and deprioritized time and time again.